“Joe” was a young Parasaurolophus, which belongs to a group of plant-eating dinosaurs called hadrosaurids. Hadrosaurids are often known as “duck-billed” dinosaurs, after the broad beaks at the ends of their snouts. Unlike ducks, which use their bills to dabble for food, hadrosaurids had beaks fitted with sharp cutting edges, perfect for lopping off swaths of vegetation. 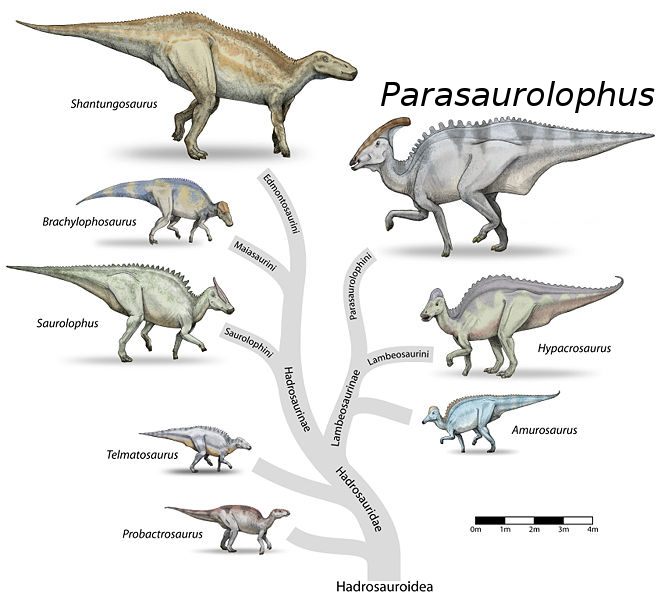 The family tree of hadrosaurids and their close relatives, including Parasaurolophus. Image modified from original by Debivort, CC-BY-SA 3.0. Hadrosaurids are just one group within the ornithischian dinosaurs, which also includes the horned dinosaurs like Triceratops and plated dinosaurs like Stegosaurus. The “duck-bill” nickname is somewhat deceptive–modern ducks are far more closely related to carnivorous dinosaurs such as Velociraptor than to hadrosaurids.